The Skinny: Though it touches upon the occasional cliché, Shutter is effective Asian horror with a few particularly haunting reveals. Fans should go home happy. by Kozo: There's good Asian horror and then there's bad Asian horror. 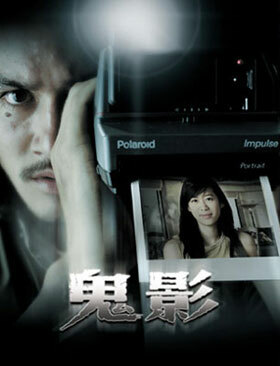 Shutter is good Asian horror. Despite using many a cliché of the genre, and possessing more than a few sequences that feel like filler, Shutter does what the best Asian horror films do: it intrigues and involves, and ultimately reveals in a possibly unexpected and haunting manner. Ananda Everingham stars as Tun, a photographer who is witness to a terrible car accident. With his girlfriend Jane (Natthaweeranuch Thongmee) driving, the two hit a woman on a dark road with his car. But instead of stopping to check on the victim's well being, Tun urges Jane to drive on. By being selfish and instinctively weak, Tun and Jane have proven themselves to be card-carrying members of the human race. But, something comes back to haunt them. While taking photos at a graduation, Tun begins seeing a pale, long-haired woman. Also, shadows begin appearing in his photos and negatives. The shadows usually resemble indistinct white shapes, but sometimes a ghostly profile - or full-on face - appears in the photos. Jane isn't doing so hot either: she encounters a long-haired woman pulling herself out of the sink in Tun's darkroom. While some debunk Tun's photos as the product of a defective camera, the woman in the sink is a dead giveaway that something's not right in Denmark. Yes, there is a spirit out there, and yes, it's pissed. The big question is what Tun and Jane can do about it. Shutter mines some potent themes. Aside from the always queasy idea that ghosts are everywhere, the film explores the idea that not all sins can be absolved. Tun and Jane may start out trying to give the ghost its due, but sometimes saying, "I'm sorry" simply won't cut it. Shutter takes that idea and runs with it, managing an emotional finish that's logical and haunting. At the same time, Shutter is effectively suspenseful. Directors Banjong Pisanthanakun and Parkpoom Wongpoom use a veritable library of proven technique and iconography, seen in modern horror films from probably every country known to man. Some of it is quite familiar - the image of the pale long-haired girl is so overdone that it possesses no surprise whatsoever. Still, it works, even in only middling horror efforts. If it's not broken, why fix it? Also, Shutter manages some creativity thanks to its use of cameras as a ghost-seeing tool. The actors do a decent, though not exceptionally noteworthy job. Lead Ananda Everingham isn't exceptionally charismatic, but he possesses an opacity of character that works for the film - especially when the big secrets start popping up. If the film has any problems is that much of its suspense has been done before. Quite often, it's one "surprise horror" moment after the next, and there isn't always a context for another freaky moment. At 93 minutes, Shutter is a fairly tight film, but even then, the middle portion of the film sags a bit. Whenever the pace slows, the filmmakers throw another "hey, that was kind of scary" moment at us. Again, it works, but the returns can be diminishing.